Welcome to Paper Puddle! Time to get your boots on and get messy! This blog is dedicated to all kinds of paper projects; card making, mini houses, journals, or anything made with paper. 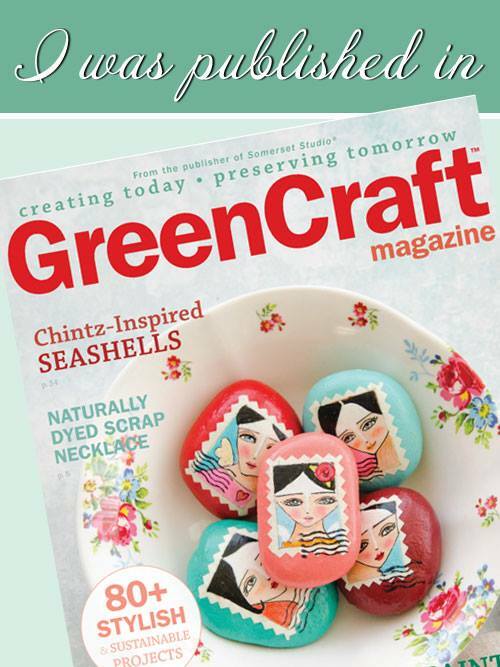 It is my hope you come away with some inspiration for your own paper projects. Happy First Week of Fall! Although it doesn't feel like fall this week in Southern California (it will be in the 90's all week), I'm in the mood for fall colors, soup, and pumpkin bread! For now, working with fall colors will have to do. 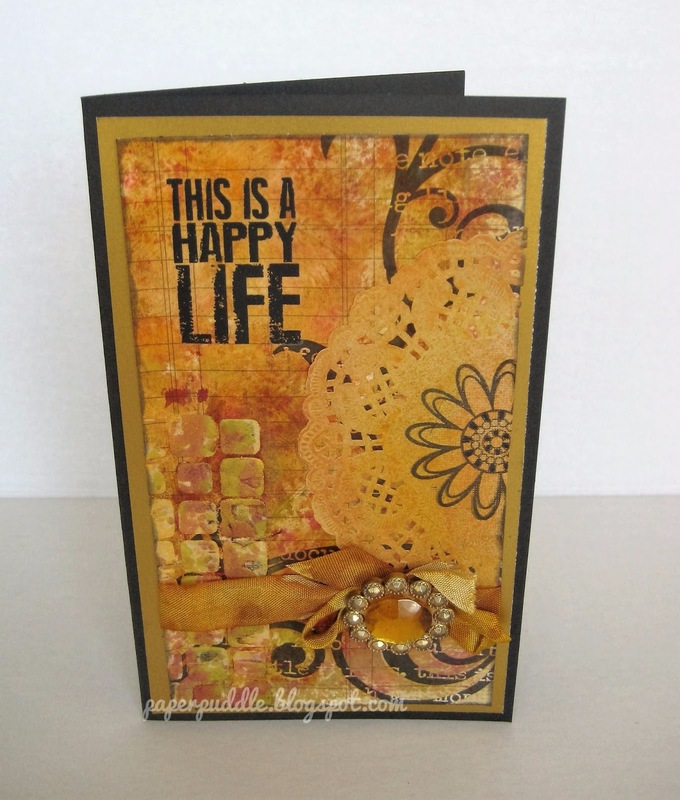 I first created the background of this card on a large piece of neutral patterned cardstock. I was inspired by Jenny over at Frilly and Funkie and the amazing technique she shared. After the background dried, I used my circle stencil randomly on the card, as well as stamping my "stitches" stamp along one edge. 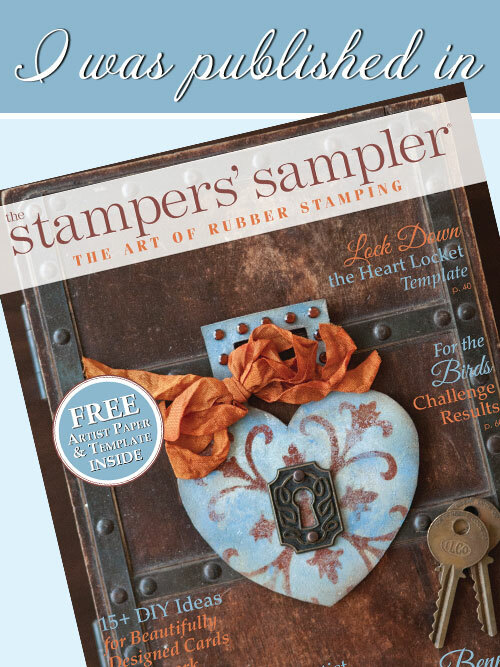 I love that stamp because I hate to sew! The butterfly is a 3 dimensional sticker I picked up at a dollar store! I layered it with patterned paper, a die cut scalloped circle, and a clear acetate design piece. The "happy" is made from stickers, and the black background piece is accented with Inka Gold (I just wipe it on with my finger). Some polka dot washi tape finishes the piece. I'm also "happy" (sense a theme?) with the next card I made. It begins with the same background as the butterfly card. 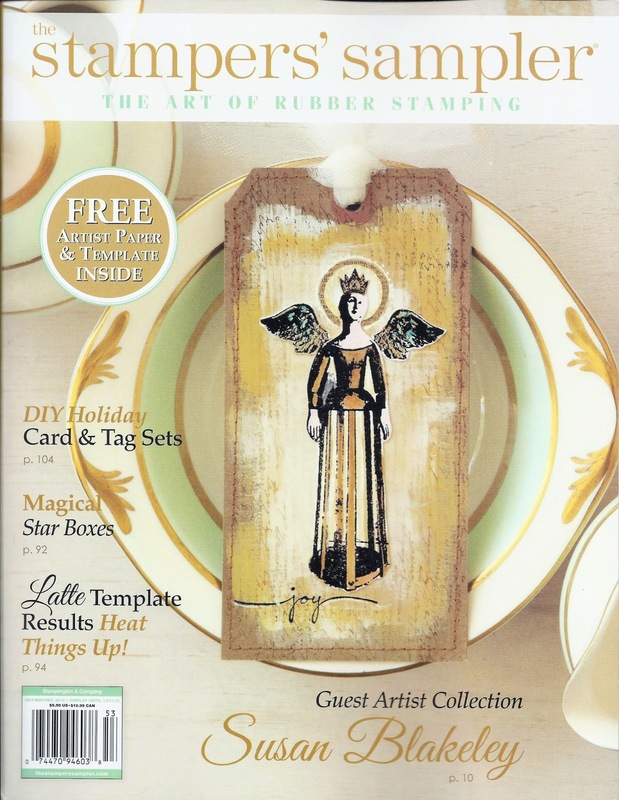 I used my Tim Holtz stencil with some texture paste along the side of this card. After drying I used the same alcohol inks to add color to the dried paste. When I added the brown paper doily, it just needed something else...does that ever happen to you? So I stamped the flower AFTER I had already glued it to the card...does that ever happen to you? Luckily it stamped perfectly. The ribbon is actually seam binding, which you can get for next to nothing online. I bought some "ugly" colors one time that were on sale, then just inked the ribbon to the desired color. You can directly apply a dye ink pad on both sides of the ribbon to color it. The jewel is from a child's play ring which I have literally had forever, glad I saved it because it really works on this card! I rubbed a bit of black ink on it to age it a bit. Thanks as always for visiting! 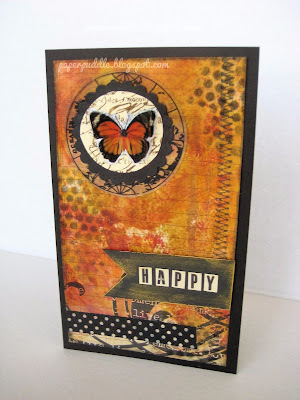 The butterfly card is entered in the Frilly and Funkie Going Around in Circles Challenge. Susan both cards are beautiful! 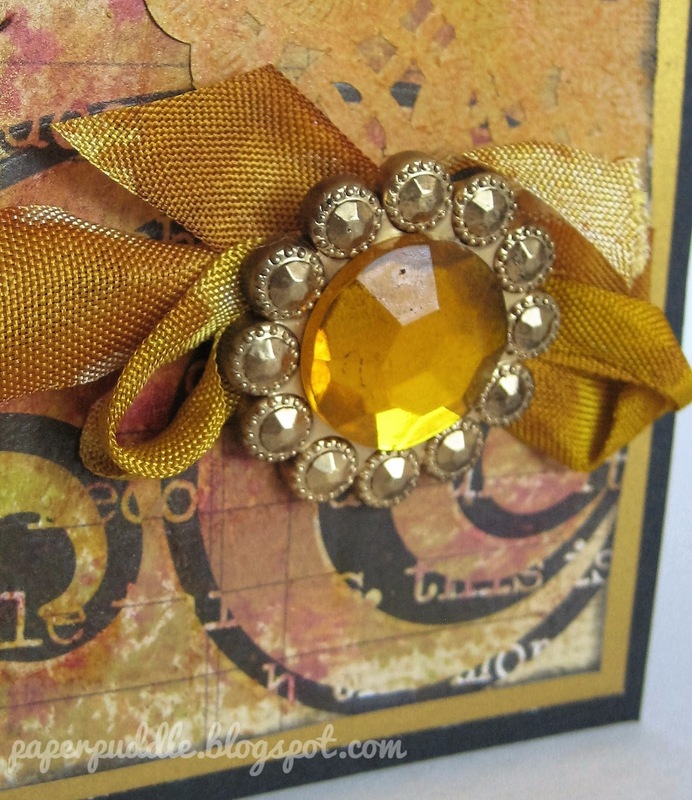 Lovely rich autumnal colors! The butterfly is the perfect focal point for your mixed media layers in the background. 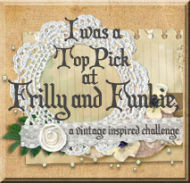 Thanks for playing with us at the Frilly and Funkie Challenge this week! I'm a mom, a wife, a teacher, and an artist. I love anything vintage, and especially love adding vintage sheet music or book pages to my art. I love to shop at flea markets and rummage sales to find old treasures. I usually have ink or paint on my fingernails; sometimes you have to get messy to create something fun! All of the work I have posted has been created by me; any products I might share with you are because that is what I used. I'm not being compensated in any way nor have I been asked to advertise any company's products.